The election is in the rearview mirror. Now people are ordering turkeys and thinking about advent calendars. We're coming up on winter and a hot coffee drink in the afternoon sounds especially nice. As if to help you combat the early darkness this time of year, Starbucks is offering 50% off all espresso drinks -- including holiday drinks -- today. For the first time since the return of its holiday drink lineup, Starbucks is launching one of its popular "Happy Hour" promotions, offering 50% any espresso beverage size grande or larger from 3pm to close (local time) on November 8, according to a spokesperson. That means Peppermint Mochas, Gingerbread Lattes, Toasted White Chocolate Mochas, PSLs -- the whole line of festive coffee drinks are up for grabs, making it a solid day to try something new or ease yourself into the holiday spirit a little early. 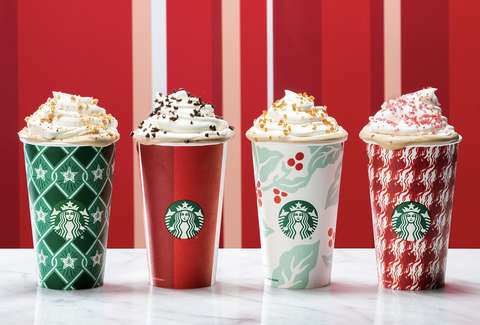 Or you can just get your usual, decidedly not festive White Chocolate Mocha or Caramel Macchiato. You have lots of options, but just note that the offer doesn't include hot or iced brewed coffee, ready-to-drink beverages, any Starbucks Reserve drinks, or blended Frappuccinos. As with most "Happy Hour" deals at Starbucks, you can get the deal if you're a member of the Starbucks Rewards Program, which means you'll get a barcode for the discount in an email or on your Starbucks mobile app. Alternatively, you can RSVP for the deal on the Starbucks Happy Hour site, then you'll get the offer in an email. It does specify that the deal is only available at "participating locations," so it's worth calling ahead to see if your local shop is participating if you're unsure. Even if this isn't your usual post-lunch pick-me-up, half-off a coffee drink is a welcome deal when you're dreaming of the weekend on a Thursday afternoon.